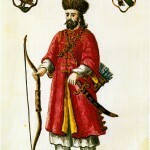 Marco Polo was finally released from captivity in August 1299, and returned home to Venice, where his father and uncle had purchased a large house in the central quarter named contrada San Giovanni Crisostomo. The company continued its activities and Marco soon became a wealthy merchant. Polo financed other expeditions, but never left Venice again. In 1300, he married Donata Badoer, the daughter of Vitale Badoer, a merchant. They had three daughters, called Fantina, Bellela and Moreta. He married Donata Badoer, a woman from an old, respected patrician family. Marco would have three children with her: Fantina, Bellela and Moreta. All of them later married into noble families. last words: "I have only told the half of what I saw!"